Soneva Fushi has picked up the Community Engagement Award at PURE 2018. The winners were announced at the PURE Awards Party hosted at Sofitel Marrakech on September 12. The Community Engagement category recognises a project or initiative that strategically and sensitively integrates the local community, aligning itself with the values of the inhabitants and protecting the authenticity of their culture, while enriching the experience of the traveller. Two initiatives won Soneva Fushi the award; the Soneva Ocean Stewards, a programme that teaches Maldivian children to swim and to learn to love and protect the marine environment, and the Soneva Eco Camp, which educates children on the environmental challenges faced by their communities in the hopes of inspiring them to become environmental stewards. “We are thrilled that Soneva Fushi won the award for Community Engagement, and we couldn’t have done it without our fantastic Community Engagement team, headed by Ahmed Moomin. They have done an incredible job teaching so many local children how to swim, training swimming instructors and raising awareness in local communities on how to safeguard the Maldives’ natural environment,” Sonu Shivdasani, Soneva’s CEO and co-founder, was quoted in a statement, as saying. Despite living in an island nation just one metre above sea level, a large number of Maldivians are unable to swim, a problem that poses a particular risk to children. According to UNICEF, child drowning is an epidemic that happens less than 500 metres from home. While safety is an important driver for the Soneva Ocean Stewards programme, it is also about introducing children to the marine life in the Indian Ocean, which many of them never get the opportunity to see. Soneva believes that if children are taught how to swim, then taken snorkelling to see reefs and marine animals, then they will want to protect the ocean. Combined with environmental education, the aim is to inspire children to become the next generation of ocean stewards. The Soneva Ocean Stewards programme is divided into three focus areas: training swimming instructors, teaching children how to swim and apply these new skills, and educating them on environmental awareness. A train-the-trainer programme was put into practice to ensure there were enough qualified local swimming instructors to have an impact on many local islands. Children in the programme can choose to take either an intensive two-week programme or weekly swimming classes over a longer period of time. The programme focused on third graders who are at a good age to learn to swim, with water festivals arranged as a means for them to put their skills into practice. 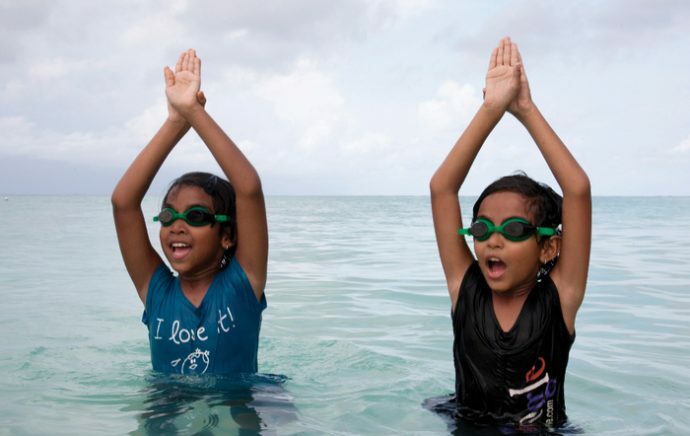 The Soneva Ocean Stewards programme has taught over 300 children how to swim, which was achieved by training 38 swimming instructors who will ensure that the number of children who learn to swim continues to increase. This programme is currently running on three local islands, which should increase by another six over the next 12 months. Conversely, the Soneva Eco Camp is an initiative that invites local children on a five-day training course at Soneva. During this time, they get to see first-hand how Soneva’s Eco Centro Waste-to-Wealth facility recycles 90 percent of its solid waste and turns it into real financial value, and also to learn about the biodiversity on land and in the sea. In addition to the Soneva Eco Camp, Soneva regularly invites local Maldivian and Thai school groups to take the Soneva Eco Tour, which are day trips to Soneva to see its Waste-to-Wealth practices in an effort to build their interest in environmental protection. Fifty children have participated in the Soneva Eco Camp so far. A collaboration with UNDP provide theoretical depth to the learnings at the camp, while experts from Soneva provided the children with tangible examples.